Somehow, celebrities always have flawless skin. That’s partly because their careers depend on it and partly because they have access to some of the best beauty products in the world. While some of the celebs on this list have skincare routines that are pretty expensive, others use age-old hacks that won’t break the bank. It’s up to you to decide which tips you want to incorporate into your own skincare regimen, but these stars are willing to share what works for them! Jennifer Lopez doesn’t mess around when it comes to skincare. This woman is nearly 50 years old and she still has the skin of a twenty-year-old. Bella Hadid loves a good hydrating clay face mask. She told Allure that her mother has a pretty impressive stash of clay masks, and that she likes to borrow a mask or two every now and again. We think that Bella can probably afford her own face masks, but it’s nice that she can share this ritual with her mother. Cindy Crawford has been able to keep her skin looking fresh for decades. How does she do it? She visits an infrared sauna weekly. She also swears that you are what you eat, and if you put good food into your body, your skin will reap the rewards. Keep reading to find out how the creator of Goop stays looking her best. Actress Kerry Washington swears by fish oil pills, green juices, and water. She also chooses not to wear foundation most of the time because she thinks it’s important to let her skin breathe. Adele went barefaced on the cover of Rolling Stone recently, proving that she has nothing to hide when it comes to her skin. She says she likes to use sheet masks, but she also doesn’t get too stressed out if she gets a pimple or two. When it comes to skincare and natural beauty in general, none of us can come close to Gwyneth Paltrow, the queen of Goop herself. This woman knows a thing or two about the beauty industry. Read on to learn how a Hollywood legend stays looking young. It seems like Alexis Bledel (AKA Rory from Gilmore Girls) just doesn’t age. This must be some kind of witchcraft. Beyoncé hasn’t spoken to the press much about how she wakes up looking flawless, but her makeup artist has done a few interviews about the techniques he uses on his clients. French actress Catherine Deneuve has been in the business for a long time. She revealed some of her best beauty tips to Into the Gloss. Deneuve said, “Every morning I drink lemon juice. It’s not so much that it cleanses anything, but I do think it’s very good for your skin and the whites of your eyes.” Do you think lemon juice could be the key to looking younger for longer? Keep reading to find out what Chrissy Teigen has to say about skincare. Zendaya Coleman somehow managed to make it through her teenage years in the public eye without ever being photographed with a raging breakout. Her skin looks pretty much pimple-free. So how did she get that glowing skin? Chrissy Teigen always keeps it real. Recently, she opened up about the toll that constant travel can have on her skin. Model Christy Turlington Burns knows that beauty starts on the inside. She keeps her skin looking healthy with a well-rounded diet. She also takes supplements containing vitamin C, zinc, marine complex, lycopene, and grapeseed extract. Read on to find out how Lady Gaga doesn’t take great care of her skin. Jada Pinkett Smith says that the key to her youthful looking skin is a ton of regular tap water and a little bit of hyaluronic acid. She is also a huge proponent of the at home facial steam. Basically, you just boil some water and place it in a large, heatproof bowl. Then you put your face above the bowl and cover your head with a towel. The steam from the water will open up your pores and help you get the most out of whatever products you apply afterward. Even though Lady Gaga’s skin looks flawless, she actually doesn’t take great care of her skin. She wears sunblock, which is very important, but when it comes to skincare, she doesn’t really have a routine. Hilary Duff keeps her skin looking fresh by drinking lots of water, washing her face regularly, and using a few choice products. “I take all my makeup off and wash my face every night,” Duff told InStyle. Read on to find out which soup Penélope Cruz believes is the key to all beauty. Model Jourdan Dunn loves luxury products and skincare services. US Weekly took an inventory of all the products Jourdan uses, and her full beauty kit costs around $1,200. That doesn’t include makeup. Jourdan said, “I see new things and I’m like, ‘Ooh! Gotta buy it!’… you need different things to protect your skin in the daytime when you’re outside.” Jourdan has a different skin care routine for every day of the week. Actress Lucy Liu always puts her best face forward. 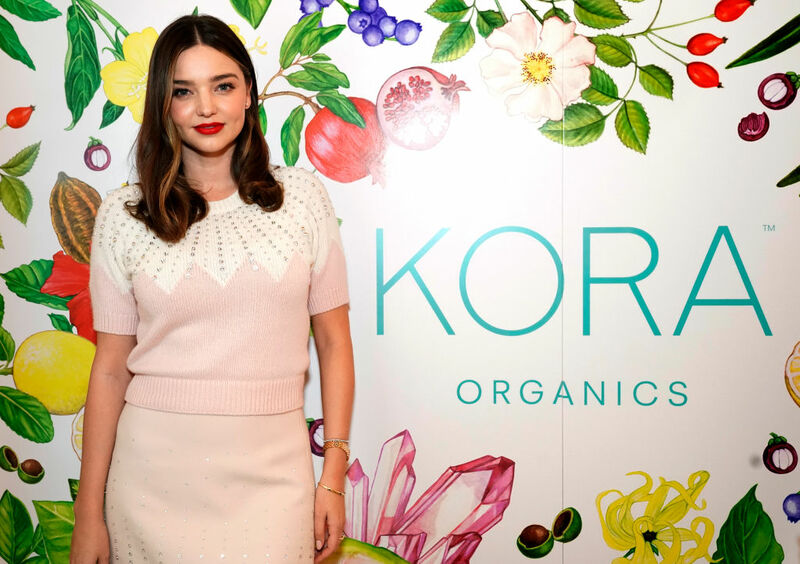 Victoria’s Secret Angel Miranda Kerr’s secret weapon is rosehip oil. It’s full of antioxidants and fatty acids and Miranda says it’s the reason she didn’t develop any stretch marks during her pregnancy. Cruz also said that she learned a lot of beauty tips from her parents who used to own a hair salon. Penélope learned how to wax legs at a young age, and she even does it for her famous friends sometimes.